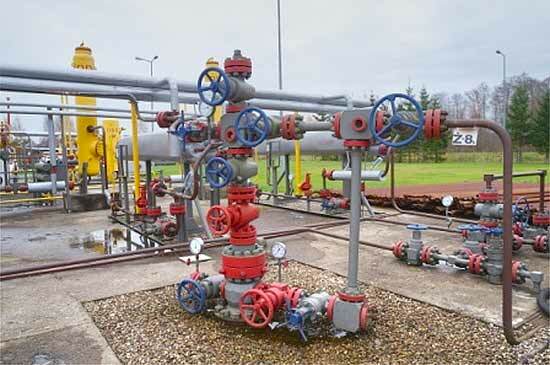 Natural gas occurs mainly in the Polish Lowlands. Gas reservoirs are also reported from the Carpathian Foothills. Limited gas resources were found in small reservoirs located in the Carpathian Mountains and in the Polish economic zone in the Baltic. About ¾ of the gas resources are located in Miocene and Rotliegend formations and the balance in Cambrian, Devonian, Carboniferous, Zechstein, Jurassic and Cretaceous sediments. In the Polish Lowlands, natural gas reservoirs are located in Permian formations of the Foresudetic and Wielkopolska regions, whilst in West Pomerania they are found in Carboniferous and Permian sediments. These water and gas drive reservoirs occur in massif and block structures. Only a few of these reservoirs contain high-methane gas, but a majority of them contains predominantly high-nitrogen gas with methane content ranging from 30 t more than 80 %. Therefore, it is frequently a methane-nitrogen or nitrogen-methane mixture. In the Carpathian Foothills natural gas reservoirs are found in Jurassic, Cretaceous and Miocene formations. They contain predominantly high-methane low-nitrogen gas, with high-nitrogen gas occurring in just a few reservoirs. These are structural/lithological multilayer (less frequently massif) gas drive reservoirs. In the Carpathians, natural gas occurs in Cretaceous and Tertiary sediments, both unassociated or associated with crude oil or condensate in gas drive reservoirs. This is a high-methane (methane contents in excess of 85%) low-nitrogen (on average, nitrogen content is in the order of a few percent) gas. In the Polish economic zone on the Baltic oil-associated gas occurs in B 4 and B 6 reservoirs. Currently, Polish Lowlands account for 69% and Carpathian Foothills for 26% of the total recoverable natural gas resources. The resources of the Baltic zone and of the Carpathians are of secondary importance (they account for 4.0% and 1.0% of national resources, respectively). As of 2014, recoverable natural gas resources were estimated at 129.75 Bcm, or 4.55 Bcm less than in 2013. The decrease is mainly due to depletion. New reservoirs proven in 2014 are Batycze, Komorze and Potok Górny (proven recoverable resources: 21.10, 340.05 and 37 Mcm, respectively). Recoverable reserves of developed gas reservoirs are equal to 106.80 Mcm, or 82% of the total recoverable reserves. Commercial gas reserves amounted to 57.30 Mcm in 2014. Buffer capacity of underground gas storage facilities in depleted reservoirs (i.e. natural gas remaining in the reservoir that shall not be recovered throughout lifetime of the facility) is included in the estimate. Gas storage facilities in gas reservoirs are: Bonikowo (buffer capacity of 328.63 Mcm), Brzeźnica (45.59 Mcm), Daszewo (27.72 Mcm), Husów (372.88 Mcm), Strachocina (121.50 Mcm), Swarzów (28.80 Mcm) and Wierzchowice (5728.12 Mcm). The total buffer capacity of underground gas storage facilities in depleted reservoirs is 6.65 Bcm. A concession for underground gas storage in the depleted former Henrykowice reservoir (deleted from the list of gas fields in 2003) was awarded in 2012. Salt caverns are also used for the storage of hydrocarbons. Currently, three cavernous underground storage facilities are operational: underground gas storage facilities of Mogilno II and Kosakowo (the latter commissioned in 2014 (1)) and the Góra underground oil and liquid fuel storage facility. In total, there were 11 active concessions for tankless underground storage of natural gas, crude oil and liquid fuels in 2014. In 2014, 5.258 Bcm of natural gas were produced from reservoirs with proven reserves, or 0.230 Bcm less comparing to 2013. Recoverable gas reserves and production data from 1989 through 2014 are presented in the following figure. Based on archival data from 1950-1990, the Polish Geological Institute – National Research Institute prepared, in collaboration with U.S. Geological Survey (USGS), an estimate of shale oil and gas resources in lower Paleozoic rocks of the Baltic – Podlasie – Lublin Basin. Total onshore and offshore recoverable resources of the Basin are not expected to exceed 1920 Bcm of natural gas and 535 million tonnes (MT) of crude oil. Considering the estimation parameters, the resources are most probably in the range of 346 – 768 Bcm of gas and 215 – 268 MT of oil (2). The first preliminary report on the estimated tight gas resources of Poland's most prospective sandstone reservoir complexes (3) was prepared in 2014 as part of the tasks of Polish Geological Survey. Three geological complexes were considered: the Permian Rotliegend sandstones of the Poznań-Kalisz zone, Carboniferous sandstones of the Wielkopolska-Silesia zone, and Cambrian sandstones in the West Baltic Basin. Based on archival data and the latest data provided by exploration companies operating in Poland, the most probable potential tight gas resources in the aforementioned regions are in the order of 1528-1995 Bcm. According to the authors of the report, technically recoverable resources can be estimated assuming a recovery ratio of 5-15 % (10% on average) for each of the regions. (2) Państwowy Instytut Geologiczny – Państwowy Instytut Badawczy, 2012 – Ocena zasobów wydobywalnych gazu ziemnego i ropy naftowej w formacjach łupkowych dolnego paleozoiku w Polsce (basen bałtycko – podlasko – lubelski). (3) Wójcicki A., Kiersnowski H., Dyrka I., Adamczak-Biały T., Becker A., Głuszyński A., Janas M., Kozłowska A., Krzemiński L., Kuberska M., Pacześna J., Podhalańska T., Roman M., Skowroński L., Waksmundzka M.I., 2014 - Prognostyczne zasoby gazu ziemnego w wybranych zwięzłych skałach zbiornikowych Polski. PIG-PIB, Warszawa.